This morning I drove over to the “cheap” gas at Arco ($2.31/gallon), when I very large white helicoptor with a blue stripe started hovering half a block away. I had my new camera on me and debated if I should drive a bit south on Tustin Ave to take photos, knowing if I did that I would officially slip into the blogger-journalist black hole never to return to normalacy. I made a left and saw that the helcoptor had extended a large cable down to whatever it was hovering over. 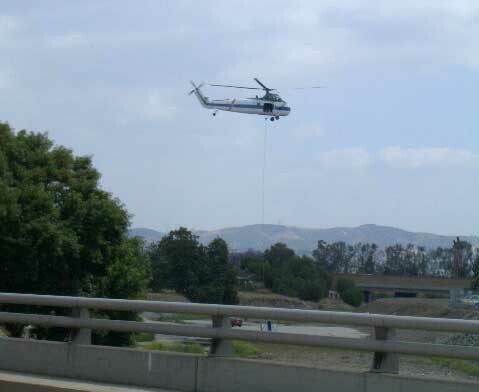 At the La Veta/dry wash bridge, I saw that the helicopter was going to lift a very large, white cube (photo above), then my light turned. By the time I u-turned around to get back to photo position the helicopter was transporting the cube into the backyard of the local convalescent/rehab center. Odd. How did it get in the dry wash? Note small compact car the same size as the cube. Could they not have had a truck take it down the driveway of the rehab center or did local teenagers spirit the large piece of equipment into the dry wash last night as a one-up on toilet papering the trees? by Ms. Jen on Tue May 18, 2004 | Permalink | fun stuff.